AS befits a city containing over a million inhabitants, Glasgow is served by two ordinary underground railways and a tube, as well as by a remarkable tunnel system under the docks and the River Clyde. It is, however, not altogether surprising that Glasgow should have obtained her first underground railway over twenty years after London, for in proportion to the size of the place, the Glasgow streets are more regular and better planned, at any rate on the north side of the river, than those of London. London, too, was the pioneer where underground transport was concerned, and many cities watched results in London before committing themselves to similar enterprises. Glasgow rests on geological strata of considerable variety, and the builders of her underground communications were faced with difficulties unknown to those who dug their way through the unchanging London clay. Beneath Glasgow they had to contend with anything from hard rock to quicksand. The circumstances which led to the building of the first underground line in Glasgow were also different from those in London. The London Metropolitan Railway came into being because of bad street communications within the central area. It has been stated, probably with some truth, that it took as long to travel across London before 1863 as to go by train from London to Brighton. In Glasgow, it was the badness of existing railway communications between the city and its suburbs which brought into existence the pioneer underground line, the Glasgow City and District Railway. In the old days, the North British Railway (now part of the LNER), which carried much of the traffic between Glasgow, Edinburgh and other centres, as well as serving many of the northern suburbs, had only one entry to Glasgow, through a steep and wholly inadequate double-track tunnel between Cowlairs and the terminus at Queen Street. 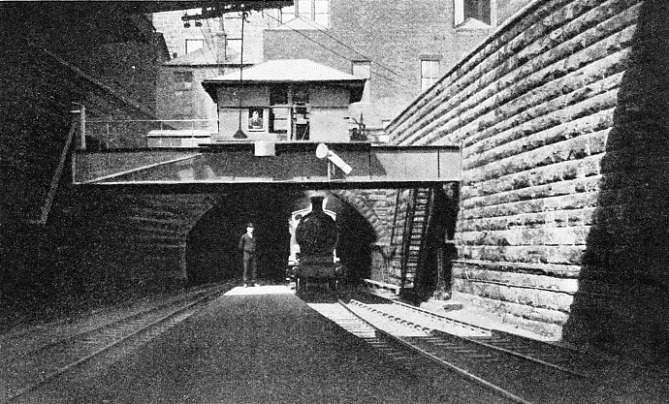 All trains leaving Queen Street, too, had to be assisted up the gradient through this tunnel by a rope operated by a stationary engine at the top, and this did not make for increased expedition. There was no way of lessening the gradient. The alternative was to build a big loop line, serving a number of stations in the busy parts of the city, and passing under the old Queen Street Station by way of a new through station set at right angles to the old line. Building such a line on the surface, at any rate where it passed through the crowded business quarters, was out of the question. The engineers had to carry the line underground throughout the confines of the city. 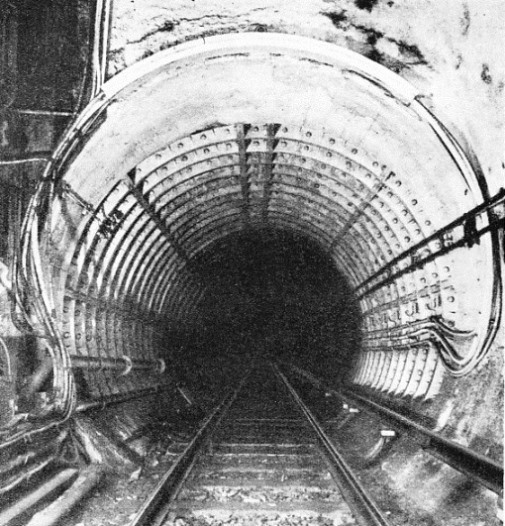 Tube construction, in those days, was all but unknown, and the engineers decided to build much of the line on the “cut-and-cover” principle, following the line of successive thoroughfares as closely as possible. “Cut-and-cover” had already been applied with complete success in London, on the Metropolitan Railway. The expression means that a huge trench is cut in the ground, lined and roofed as necessary, and that the ground is then made good again on top of the roof. UNDERGROUND RAILWAYS OF GLASGOW. The first to be built was the Glasgow City and District Railway, and work started in March 1883. The line was opened to traffic in March 1886, and nearly two and a half miles of it were tunnelled. The Glasgow Central Railway dives underground near Dalmarnock Road, passes through the centre of the city and emerges before crossing the River Kelvin. The Glasgow District Subway is a tube railway six and a half miles long. It makes a complete circuit and passes under the Clyde twice. Glasgow’s pioneer line was authorized in 1882, and building of the original section began in March of the following year. It involved a little less than two and a half miles of underground railway, apart from ordinary tunnel and cutting work on the long approaches. Excavation went on almost simultaneously all along the proposed route, but it will be most convenient to describe each section in turn, from west to east, taking first the Kent Road “covered way” in the West End. The Kent Road section had a length of 700 yards. Trial borings showed that there was a subsoil of mud and sand to about foundation level, with a stratum of solid rock below. This mixture of muddy sand was full of water. The tunnellers had to drain the water away, without allowing the sand to run off with it. First they excavated a trench on the north side of Kent Road, timbering as they went. Water soon began to percolate through the timbering, and when the men were within 5 feet of foundation level, a mixture of water and sand came gushing through so fast that they had to abandon this section for the time being. At the same time some ominous cracks appeared in the walls of buildings on the north side of the street. To drain off the water the engineers laid down a 4-feet drain along Finnieston Street and Claremont Street to carry the water down to the Clyde. This water passed first to a sump, and then through a siphon into the drain itself. This arrangement effectively prevented the carriage of sand by the water. The sand remained firm and became quite dry, thus saving the threatened buildings and guarding against collapse of the workings. Once the water had been successfully dealt with, the engineers were able to begin the “covered way”. First they drove a double row of sheet piles, one row on either side of the street, the intervening space being 35 feet wide. Nearly all these piles penetrated the underlying rock at depths varying from 20 feet at Dumbarton Road, at the west end, to 30 feet at Charing Cross, nearer the centre of the city. Then, working between these rows of piles, the engineers took up the road and excavated the ground beneath it to the shape of the proposed tunnel roof. The future concrete arch, forming the roof, was thus represented by the cleared space, and the future tunnel space and its lining by the unexcavated earth below. The tunnellers carried out this job in sections, each having a length of 15 feet. Then they filled each successive excavation with concrete, forming their arch, which was 2 ft 3-in thick at the crown and 6 feet thick at the sides. When the concrete arch had been set, the engineers restored the road above it, carried off the surplus spoil, and proceeded to the next section. The excavation of the tunnel proper, beneath the new concrete arch, was conducted from pits set at intervals along the route, the tunnellers carrying their headings along between the pits. As the headings advanced, now that the new drain had been put in, the surrounding sand dried out automatically, the water flowing straight to the Claremont Street pit and thence passing into the drain leading to the Clyde. Ground water did not provide the only trouble of this kind. There was a big sewer following the line of the street above. The men had to take this sewer down, section by section, as they proceeded, diverting the sewage into one or other of two special pipes, which they had previously laid in the sides of the heading. While one set of pipes was being carried forward, the sewage passed through the existing set, and thus the heading and the diversion of the sewer were carried forward together, step by step. TWO SECTIONS THROUGH THE GLASGOW DISTRICT SUBWAY. Each track is laid in a separate tube with an internal diameter of 11 feet. Rail level is 1 ft 6-in above the tube. In places where it was essential to avoid subsidence the borings were faced with concrete and lined with iron segments (left). In other places it was possible to use bricks only (right). The distance between the tube varies (at the left it is 6 feet at the right 3 feet), but the average is about 4 ft 3-in. The next thing was to sink a double row of small sheet piles from the bottom of the heading to foundation level. The sand was then slowly excavated between these rows of piles, giving that outside the piles plenty of time to dry out. When the outside sand was completely dry, and therefore safe to deal with, that was excavated also, the concrete arch above being supported mean-while on huge timbers. Having completed this work, the excavators began to put in the brick-lined side walls of the tunnel, filling up the hollows and fissures in the rock with concrete as they proceeded. The bricklayers took over from the excavators as soon as the spaces had been cleared for them, and they took only twenty hours on an average to brick a length of 18 feet. The final operation consisted of bricking the inside of the arch, thus completing the section of tunnel. In places where the soil was unusually bad, the tunnel was strengthened by concrete inverts, though this was not universal. Work began on the Dumbarton Road to North Street section, 700 yards long, on May 26, 1883. It was completed on April 20, 1885. Piledriving took place at irregular intervals and, out of consideration for the residents on either side of the workings, it was never carried out at night. The section running eastwards into the city from North Street presented different problems. Here the tunnellers had to pass through a hill at a downward incline of 1 in 200 as far as a point a little to the east of West Nile Street. The workings passed through a stratum of freestone with an overlying mass of boulder clay. First the men excavated the boulder clay and rock down to within 9 feet of what was to be rail level; they then sheared the sides and quarried out the rock until they reached foundation level. This plan they carried out both between boulder clay and rock and when working wholly in rock. Where the top of the tunnel was in boulder clay additional support had to be given. Ordinary tunnelling progressed in sections of 15 feet, except on the future site of Charing Cross Station, where, to guard against subsidence, 12 feet was the maximum allowance. Eastwards the strata began to shelve sharply, leaving the tunnel completely surrounded by boulder clay. This, as it was excavated, was removed through the ordinary working shafts, except where the tunnel widened out at Charing Cross. Here it was dealt with by means of a special inclined plane leading to the already cleared site of the station. Some of the spoil served for the building of earthworks on the above-ground sections of the line in the outer parts of the city. Through the boulder clay, the excavators proceeded section by section, each being 12 feet in length over this stretch. The boulder clay was intractable. It was impossible to prevent a certain amount of subsidence, and the contractors had to pay large sums in compensation to the owners of property which had been thus disturbed. Blasting of the boulder clay was out of the question. The excavators had to dig stolidly through it. Progress along this stretch was at the rate of about 33 feet a month, three-quarters of the time being occupied by excavation and the remainder by erecting masonry work. Where the route of the tunnel lay through the centre of the city, its course once more passed through the top stratum of mud and sand, and the cut-and-cover methods of Kent Road were resumed. There was, however, a difference in procedure here. Once the concrete arch which was to support the road surface had set, the men excavated the whole of the tunnel at once, instead of proceeding in two stages. Where the covered way crossed the busy thoroughfare of Renfield Street, the engineers supported the tramway tracks and causeway on timber piling overnight, so that traffic was uninterrupted while excavation and building were going on underneath. The final part of the western section, down to Queen Street Station, lay once more through a stratum of freestone, and quarrying was resumed. The section running eastwards from Queen Street proved to be formidable. Its course lay through a mixture of shale and sandstone, overlaid by a light stratum of boulder clay, with mud and sand above. It was about the worst formation the engineers could have encountered. A great deal of subsidence took place, and all the houses between Frederick Street and John Street had to be pulled down and rebuilt or replaced after the completion of the covered way. SECTIONS THROUGH STATIONS on the Glasgow Central Railway. That on the right is formed by a brick arch, with the haunches filled in with concrete, and a concrete invert. In the station on the left the arch is replaced by brick walls, with concrete extending outside them from the invert. The flat roof is formed by steel girders. A drain runs below the rails but above the invert. Farther on, where the rock stratum rose 12 feet above the top of the arch, ordinary tunnelling was resorted to, and no further damage took place. The easternmost section of the original route, the covered way under the old High Street, was carried out largely by normal cut-and-cover methods. The engineers drove their double row of piles 35 feet apart, placed struts between them and excavated the enclosed material. They then built a covering brick arch, filling in its haunches (shoulders) with concrete, and putting a layer of puddled clay between the arch and the roadway above. In one place the rock disappeared below foundation level, and a concrete invert had to be put in. Where the rock was a long way down, there was danger of the entire workings, arch, piling and all, sinking down through the soft mud and breaking up. Here the engineers built brick cylinders, weighted them with pig iron, and allowed them to sink. The farther they sank, the more brickwork was added on top until they finally touched rock-bottom. The mud was then drawn out of their interiors, and they were filled up with concrete. On these the concrete arch ultimately rested. Queen Street (Low Level) Station, which has four tracks serving two island platforms, was built by excavating a series of bays beneath the old terminus overhead, so as to interfere as little as possible with existing traffic. This part of the work took exactly two years. The total cost of the whole Glasgow City and District Line came to £706,763, including legal expenses and compensation. Of this sum £588,163 was accounted for by the underground section of the line. The line was later extended to a branch terminus at Bridgeton Cross, thereby providing a convenient stopping and starting point for traffic running along the north bank of the Clyde. Traffic to and from the western suburbs of the city was similarly arranged to be dealt with at a corresponding branch terminus in Hyndland, at the west end of Glasgow. The Glasgow City and District Railway was opened for traffic on March 15, 1886. It was taken over by the working company, the North British, in the following year. For a time the Glasgow City and District Railway was the only underground line in Glasgow, but the ‘nineties saw the building of two more, one an ordinary low-level line such as the City and District, and the other a “tube”. The first-named was the Glasgow Central Railway, situated, for the most part, much nearer to the Clyde than the Glasgow City and District. The Glasgow Central Railway begins at a point some way north of the Dalmarnock Viaduct across the Clyde, dives underground, and bears roughly north-westwards towards the central districts. Passing through stations at Dalmarnock Road, Bridgeton Cross, Glasgow Green and Glasgow Cross, it reaches a four-tracks low-level station beneath the main-line station at Glasgow Central. It then passes on through Anderston Cross to Stobcross, where it crosses the older City and District. Thence it runs under the length of Kelvingrove Street, emerging in the West End and crossing the little River Kelvin, ftaally dividing and running to the west and north. Powers to build the line were obtained in 1888, and Charles Forman was appointed Engineer. His was anything but a light task, because of the nearness of most of the route to the Clyde, and the occurrence of many important sewers right in the line of penetration. Three large intercepting sewers had to be diverted, the biggest having a width of 14 feet and a depth of 7 feet. There was also a network of gas and water mains, and of telegraph cables, all of which had likewise to be diverted with as little interruption as possible to the services they provided. Altogether, some £300,000 was spent on this work alone, before operations could be started on the covered way. 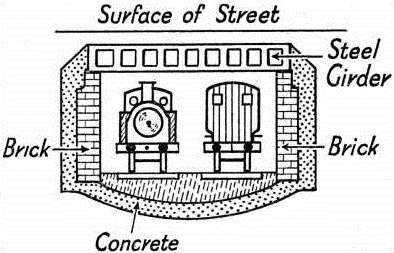 On the site of the low-level station at Glasgow Central there existed a quicksand, necess-itating the building of an elaborate system of drains and culverts to carry off the water. This work had to be carried out under air pressure. Moreover, by the foundations of the railway bridge across Argyle Street, the men had to sink supporting cylinders to a depth of 40 feet, and carry out underpinning with walls 13 feet thick. In the neighbourhood of Great Western Road, towards the western extremity of the line, the builders encountered masses of old coal waste, a detestable material to the tunneller, necessitating a great deal of expensive underpinning. Where they carried their route beneath the existing streets, the engineers erected an overhead platform above the traffic, on which ran a travelling piledriver. They were thus able to drive their piles on either side of the street simultaneously, after which they took up the road surface, erected a timber causeway to carry the traffic, and excavated the ground below by hand. Where the way had to pass under Glasgow Green there was no necessity for this, and they were able to proceed by the cut-and-cover methods in the open, with a big steam crane for raising the spoil in skips. For the most part, the engineers used two systems of construction. 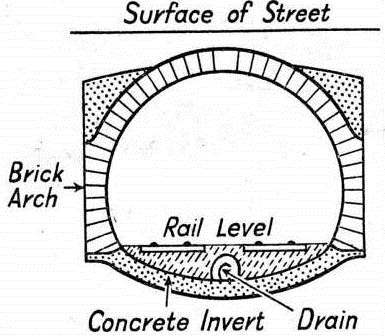 The one type of tunnel consisted of a brick arch with the haunches filled in with concrete and a concrete invert below, a drain running along below rail level, but above the invert. In the second type of tunnel, the brick arch was replaced by perpendicular brick walls above the invert, with concrete extending upwards from the invert outside the brickwork - that is, between it and the soil. A flat roof was formed by steel girders. Both types of construction were adopted in the various underground stations. The flat roof was essential where there were four tracks, as at Central (Low Level), in the heart of the city. The girders forming the roof were composed of mild open-hearth steel having a tensile strength of 26-30 tons per square inch. Altogether, the work required about 25,000 tons of steel and some 70,000,000 bricks, the total cost amounting to about £1,500,000. The first sod for the Glasgow Central Railway was cut on June 11, 1890, and the opening took place on August 10, 1896. Including the preliminary work of diversions and so on, however, the task occupied about eight years. BRICK ARCHES were used for some lengths of the Glasgow Central Railway. The diagram shows how the line was built in what is almost a covered-in trench. Some 70,000,000 bricks were used for the line. The two underground railways just described have always been worked by steam, though experiments with diesel traction have recently been carried out on the Glasgow Central line. An earlier experiment, worthy of notice, involved the electric lighting of trains on the City and District line, current being picked up from a special conductor rail in the tunnels. That was before the days of the self-contained system with a generator on each carriage. The Glasgow District Subway is a tube line pure and simple, consisting of two parallel tunnels six and half miles long, making a complete circuit of Glasgow and passing under the Clyde twice. More than once during the ‘eighties attempts were made to obtain the authorization of a subway or tube line worked by electricity or cable haulage, but not until 1890 was such a line sanctioned. The engineers, Robert and Alexander Simpson and W. S. Wilson, were faced with a task no lighter than their colleagues on the low level lines had been. They had to carry their tunnels through a considerable variety of ground, much of it bad. From Govan to Partick, the line was to cross beneath the Clyde, through mud and sand. Through Partick, the route lay through successive strata of clay, rock, shale and that unpleasant coal waste which was simultaneously causing trouble on the Glasgow Central line. Under the high-lying ground to the north of the city the material was chiefly sandstone and shale. On the south side, running in the opposite direction from Govan, lay an area of clay and muddy sand extending to Shields Road. The remainder of the route, comprising the south-eastern segment of the “circle”, lay through brick, clay, sand and sandstone. The whole route of the Glasgow District Subway is below ground, access from the workshops at Govan being effected by a sort of oblong well, with the tracks running along the bottom and a car hoist erected above it. The average depth is 29 feet, but it varies from 7 feet to 115 feet, passing under the Clyde at a depth of 56 feet below high-water level. The southern section is nearest the surface and several stations are lighted by daylight through glass roofs. In the north of the city, however, the line is at its deepest between Kelvin Bridge and Hillhead. The builders of the Subway used five different methods in driving the tunnels, varying them according to the nature of the material through which they passed and to their depth below the surface. The diameter of the tubes was only 11 feet, and they were set 4 ft 3-in apart on an average, except at stations, where both lines were to run through a single large tube, with an island platform in the middle. The simplest form of construction to be carried out was the ordinary cut-and-cover, but this occurred only on certain stretches near the surface on the south side of the Clyde. Where it was difficult or impossible to drain the surrounding material, as in the wet mud and sand adjacent to the river, the engineers used underpinning under air pressure. Where it was essential to avoid any degree of subsidence, the engineers proceeded in orthodox “tube” fashion, building up their tunnel out of iron segments as they proceeded. In other places, where there was less danger from subsidence, they lined the boring with brickwork. Through waterlogged material lying at a considerable depth, they used the iron tube system again, working at a considerable pressure. The engineers encountered some difficulty, of an unexpected nature, where the line of the Subway crossed beneath that of the Glasgow Central line. By arrangement, the Subway company had to build the superimposed tunnel of the Central for a distance of 150 feet on either side of its own route. The tube sections were built with the aid of sixteen steel shields, each weighing approximately 6 tons, and operated by six hydraulic rams working at a maximum pressure of 2,200 lb per square inch. The usual pressure, however, did not have to exceed 800 lb in normal conditions. Each shield was 6 ft 6-in long, and had an inside diameter of 12 ft 1½-in. The builders of the Glasgow District Subway completed their task towards the end of 1896, and the line was formally opened on December 14 of that year. Excluding the old Tower Subway in London, the Glasgow Subway was the second tube in the world, being preceded only by the City and South London. The gauge of the railway is 4 feet, an unusual width, and from the opening to as recently as 1935 it was operated by cable traction, this being the only large-scale application of such a principle in Great Britain, apart from the old Edinburgh tramways. The cables ran on rollers between the running rails, and were worked by a pair of non-condensing steam engines, each with a single cylinder of 42-in diameter and 72-in stroke. The cables were really a single endless wire rope, approximately thirteen miles in length. The cars ran in pairs, the driver controlling a screw-operated grip to lock the car to the constantly moving cable for travelling and to let go the cable when a station was reached. Current for lighting was picked up by a bow collector from wires mounted at one side of the tunnel. In 1935, the Glasgow Corporation, present owners of the Subway, electrified it, thus bringing it into line with other underground city railways in other parts of the world. The steepest gradient is 1 in 20, which occurs on both sides of the river at the Govan-Partick crossing, and on the north side at the Bridge Street-St. Enoch crossing. The Glasgow Harbour Tunnel under the Clyde is associated with the name of Alexander Simpson, who was one of the engineers of the Subway. Alexander Simpson was Resident Engineer on the works of the Harbour Tunnel. 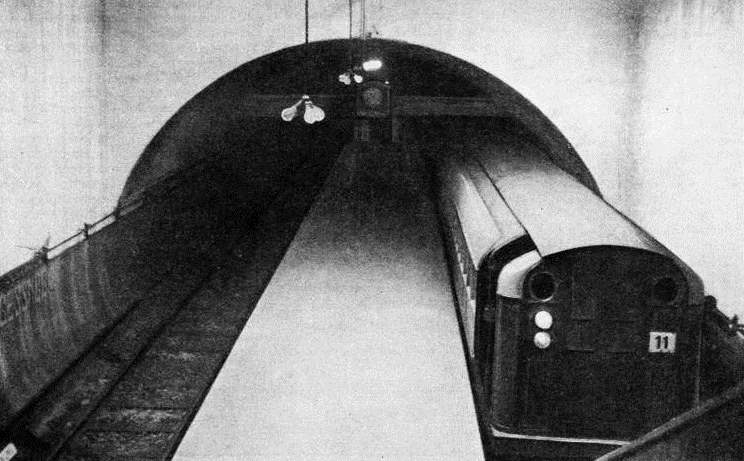 This tunnel, or rather set of tunnels, for there are three running parallel, does not accommodate an underground railway, such as those already described, but is for the benefit of road vehicles and pedestrians. ROOF GIRDERS OF STEEL were used in some parts of the Glasgow Central Railway. Mild open-hearth steel was used, with a tensile strength of from 26 tons to 30 tons to the square inch. About 25,000 tons were used. At the end of the nineteenth century, Glasgow was at a dis-advantage because of the poorness of cross-river communication below Glasgow Bridge. The present great bridge across the harbour was not built then, and everything depended on ferries, which are at the best a makeshift. Engineers discussed various proposals for bridging the Clyde at Finnieston with either a high-level bridge or a movable bridge of some kind. The time for the high-level had not yet come; motor transport was still a thing of the future, and a movable bridge in such a busy quarter would prove a nuisance to navigation and traffic. In 1890 Parliament authorized the building of the Clyde tunnels, and work on them began on February 3 of that year. The southern shaft was the first to be sunk. The engineers began by removing the top stratum of sand to a depth of 14 feet. Then they struck water and had to rig powerful pumping appliances before they could go any farther. For penetrating below the 14-feet level, they built a double ring of segments, each 2 feet deep and furnished with a cutting edge. As the ring sank they super-imposed further rings and filled them with concrete. At a depth of 48 feet the sand gave place to boulder clay, and great difficulty was experienced in keeping the succession of rings plumb. At one point the cylinder was canted over 12 inches out of the true, and had to be weighted with pig iron on one side to bring it on a level footing again. At a depth of 54 feet the engineers stopped sinking the cylinder and completed the remaining 21½ feet of the shaft by excavating it and underpinning with massive brickwork. A vein of sand in the boulder clay caused trouble, and necessitated the sinking of sheet piling, which remained in position until 1893. The bottom of the shaft received a flooring of concrete 2 feet thick, resting on the underlying boulder clay. This southern shaft alone cost nearly £12,000. In sinking the northern shaft, on the right bank of the river, the engineers encountered no boulder clay, but a bad layer of wet sand, extending from top to bottom. They experienced great trouble from water, as might have been expected, and in the end the pumps were dealing with as much as 200 gallons a minute. They used iron segments throughout this shaft, putting in an inner iron lining and filling up the intervening space with concrete. The tunnels for vehicular traffic were bored horizontally between the bottoms of the shafts, hoists, or lifts being erected at either end. Vehicles descend the shaft to the level of the tunnel in the lifts and reach the surface in the same way on the other side of the river. The pedestrian tunnel was bored between the two vehicular tunnels. It was given the profile of a shallow V, with entrances 34 feet from the tops of the shafts and downward inclines of 1 in 3 towards the underwater section. From the bottom of the southern shaft of the Harbour Tunnel a stratum of boulder clay extended about one-third of the way across the course of the Clyde. Through this stratum the engineers had no difficulty in driving an 18-feet tunnel, lining it with brick as they progressed. As they drew near to the sand, however, they substituted an iron-lined tunnel built, up of segments. The downstream tunnel, was the first, and the men were able to drive the first 60 feet without using a shield or compressed air. After that they brought a shield into use and worked in compressed air, the maximum pressure used being 18 lb per square inch when they were working in wet sand right under the middle of the river. At the northern end this had been reduced to as little as 2½-lb. The western boring was all but complete when work began on the eastern, or upstream tunnel. In this, a “sand back” came through the boulder clay, and the tunnel was flooded, luckily on a Saturday night when there were no men in the workings. Twenty-four hours sufficed for the righting of this accident, the tunnel “blowing itself dry” under a pressure of 15 lb per square inch. This was the only really alarming accident to take place, though the material pierced was of the most unpromising description. The central tunnel, for foot passengers, was bored without major incident. The engineers completed the eastern tunnel in November 1892. The western tunnel, which had been held up so that full attention could be given to the eastern tunnel, followed in February 1893, and the tunnel was finished in November of the same year. The Glasgow Harbour Tunnel was the first to involve boring under the River Clyde; for the Glasgow District Subway, which crosses twice under the river, was not completed till three years later. CESSNOCK STATION is typical of the stations on the Glasgow District Subway. At the stations the tubes merge into one large one, with an island platform between the tracks. The conductor rail runs on the outside of the track. The average depth of the tube is 29 feet. You can read more on “London’s Underground Railways” on this website. You can read more on “Railways Under London” and “A Scottish District Subway” in Railway Wonders of the World.